After I read Spoon the first time, I wondered: how has this not been written before? It’s got all the ingredients of a spoon-to-be classic: a little spoon, envious of knife, fork and chopsticks and their disparate talents, embarks on a countertop journey to discover what makes him unique. From the amazing Amy Krouse Rosenthal (Little Pea, Duck! Rabbit!, Uni the Unicorn). 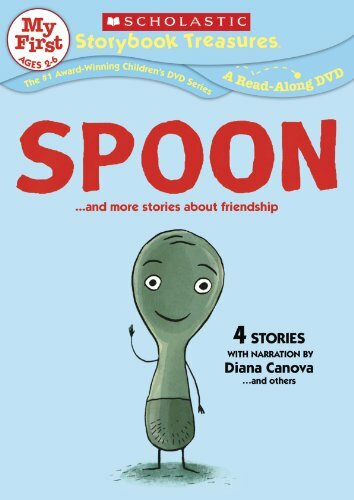 Spoon is published by Disney Hyperion Books. New York Times Book Review article also has the scoop on Spoon. Wow! Read it. An epicurean’s review can be found here. Seven Impossible Things Before Breakfast blogged about it. Indie Bound “Next List” pick for Summer 2009! Here's an activity idea for Spoon: draw a family portrait using an everyday, household object. Thanks to the Guiteras Elementary School library for the link! A tribute I drew for Amy upon her passing in March 2017. Our first book signing. Illustrator Scott Magoon read a ton of books at the local library. Review to come. See Spoon come to life in this stirring animated short by Scholastic’s Weston Woods! This is a preview of the full-length presentation and is wonderfully narrated by the author, Amy Krouse Rosenthal. Amy and I reading Spoon at the Blue Bunny. Spoons & balloons! At the Blue Bunny in Dedham, MA.